I'm writing to you to thank you for an amazing effort last Saturday !!! You couldn't have been any unluckier with the weather literally three heavy showers within an hour of " kick off" !! And the following three nights we have had perfect sunsets at 7.30pm every night - unbelievable. But you managed it all and kept your cool and carried out Lucy's wishes to a T. So well done and thank you again. The table and the setting were sensational and the overall atmosphere couldn't have been bettered or improved - truly well done. We are now leaving for the summer so I guess all I can do is say - see you around and have a great summer!" On behalf of John and I, we would like to sincerely extend our appreciation for the efforts you both contributed to the setups for the Board. Your finesse, style, quality and hands-on approach paid tribute to what was presented. They were blown away with the boardroom and the tea breaks. We really consider you as partners and are always appreciative of your efforts, thank you from us both! World class!" On behalf of the Nassau Royale Dinner Committee I wish to extend our sincere thanks to you and your entire team at Wildflowers for all the hard work of planning and the beautiful decorations displayed at our function. We are continuously receiving compliments on the beautiful decor. 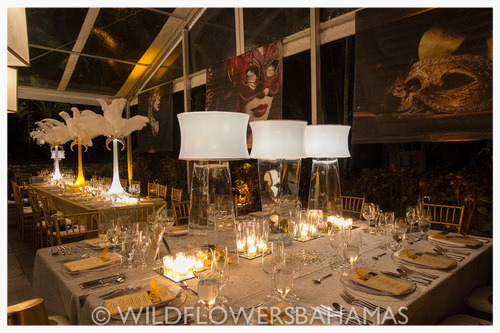 It is always a pleasure working with Wildflowers and for this event you went above and beyond. We appreciate your kindness in providing items at cost as this allowed us to raise a significant amount of money for the Governor Genera's Youth Award, a program that helps so many young Bahamians." I really want to thank you, you did a fabulous job and I had a really great experience working with you." "Natalie: I finally got a moment to sit down and I thought that I would take a moment to express our sincere thanks for your company's extraordinary work on December 15 this year. Wildflowers always delivers the most extraordinary room decor ever and this year was no exception. IT WAS AMAZING, BREATHTAKING. WORDS ESCAPE ME. Every year, it gets better and better. Once again you and your staff blew us away. Our staff always feels like royalty. Please extend our thanks to Araxie who always gives of her time unselfishly and always works very hard to ensure that my vision for our event is realised. This year I gave up control and look at what happened. I truly believe that this was our best year yet. Thanks to you Natalie. Patrick was really accommodating this year and is so very gracious. THANKS AGAIN. WE ARE TRULY GRATEFUL... THERE ARE NO WORDS TO EXPRESS HOW WE TRULY FEEL." I had so many, many compliments last night on the decor and ambiance created by your team of talented decorators, not to mention your endless truckloads of props, candles, plants, bars, furniture and even twinkly overhead lights. Your incredible generosity transformed the Melia ballroom into a lush and inviting tropical garden setting, defying all our expectations! The beautiful setting set the stage for record-breaking fundraising, and we could not have contemplated this level of success without your help. We are so grateful for your support and generosity and hope that you share our sentiments with your management and staff." Thank you so very much for everything! The tent was beyond perfect! It was everything I imagined it to be and more! I can’t thank you enough for helping make Saturday night such a perfect event. Thanks for making the process so easy and provided us with such a beautiful outcome!" What a great team you sent to us last night! The food was delicious, the ladies serving so professional and friendly, and the bartenders marshaled on even under a drizzle. Thanks so very much!" "Paradise Plates 2015 is a wrap! It's always hard to believe that a 4-hour event takes months in planning and you've been there every step of the way with the most incredible spirit of generosity. On behalf of our small but mighty team, I say THANK YOU. Thank you so very much for continuing to support the organisation and provide critical resources, fundamental to our event's success." I would like to say Thank You from OOOC Management for your assistance with our Employee event yesterday. It was a great success and we could not have achieved this without out your continued support. " To echo Ray’s sentiment, a sincere thank you for assisting us to execute the event which was exceptionally well received by the team!! Looking forward to continuing our great relationship and cohesion into the future." "Natalie: Wow!!! another amazing job by Wildflowers. It is always a challenge trying to find the correct combination of flowers to ensure that our events are over the top, but reflect a more corporate feel and not have a wedding look, and you and your team has truly achieve this with this event. I was concerned about how we would be able to top the event last year for this exact same event, and I must say that you did it. You and Araxie worked with me to ensure that my vision with your extraordinary touches came together to create a blow away experience and I am happy and proud to say that we did. The flowers in the lobby truly conveyed what wanted, the Flamingo wedding setting was sweetly beautiful, but Crusoe's restaurant took my breath away. I truly almost cried when I saw the room. The decor that you provided truly transformed the room. You have a real gem in Araxie. Araxie's commitment to your company is undeniable working through her illness and not missing a beat. Your crew had from 10:00 a.m. to 12 noon to set-up, and they were done right on time... Amazing! Once again an unbelievable job by Wildflowers Bahamas. Thank you so very much." I wanted to send you a quick note and share how impressed I was with all the service and décor you provided at our event in Atlantis. All of the guests had nothing but compliments on the Reception and the Gala décor. Please give yourself a pat on the back for a job well done!" It goes without saying that I truly appreciate you and WildFlowers, but just when I felt that you could not impress me anymore, you go over and beyond and and put together a room like you did last night. Let me just go on record by saying you are a creative genius, it is truly a God given talent that you have... an eye for all things spectacular. It was difficult getting persons to settle down and pay attention at first because they were blown away by the room. The color scheme worked out well and the stage and 2 seating areas, well! what can I can? I am not worthy!!!! This area was breathtaking. You know that I now love blue and silver now right? It is amazing how you can take a suggestion and translate it into something spectacular. My request for some candles near the plexiglass podium turned into two towers or plexiglass stands with candles, and my request for elevating some of the table arrangements, turned into extra crystal vases spilling out with flowers from one of the vases already there, which transformed the middle of the tables and centerpieces into art displays. Wow!! Wildflowers should be up for an award for the spectacular work that you all do. You and Wildflowers far exceeded our expectations and the most important thing is that our employees loved it and felt very special. They are truly our number one asset and we say "thank you" so very much to you and your gracious and talented staff for doing a fabulous job, well done. I missed Araxie on Friday, but please pass on my regards to all of your hard working and dedicated employees, and I feel that both of us are very lucky to have the employees that we do. Once again, thanks a million, and until our next function, which is coming up pretty quickly." You definitely go the extra mile and offer an exclusive and very flexible set-up. I really much appreciated and I’m looking forward to working with you in the future."